SUPPLEMENT TO "OUR DOGS. ", December 10, 1926. Harnessing up Mother and puppies sired by CH. Antarctic Bru. Mrs. Kilburn-Scott has not only run a successful kennel for thirty years, but she is practically the founder of the Samoyed breed. Every champion and prize-winner in England and America has sprung from her stock. Great care has always been taken at the Farningham kennel to import and breed nothing but the corect type. America, France, and Holland have been successfully supplied with excellent specimens. Mrs Kilburn-Scott offers for sale some beautiful puppies and young dogs. The famous young champion, Polar light of Farningham. 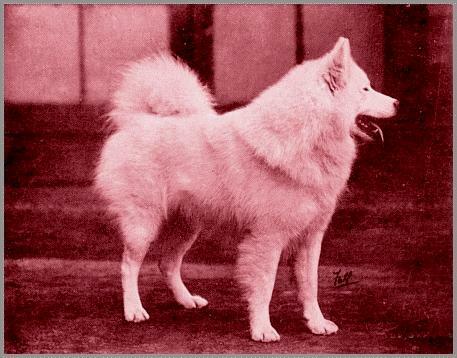 Winner of challenge certificate at Cruft's Show two years in succession—1925 and 1926.